METALLIZING & OTHER HEAT PROCESSES. you want to make the right choice. That requires careful consideration of your individual requirements because no one system is right for every application. That’s why UNIQUE/PERENY has developed a wide selection of performance proven kilns and furnaces backed up by an experienced engineering staff to help you select the one that’s right for you. a broad range of ceramic, metal and glass products, UNIQUE/PERENY offers pusher, sled, roller hearth, and car type tunnel kilns and furnaces that are routinely used at temperatures up to 3100o F. These are shipped factory tested as fully wired and piped preassembled modules or complete systems, ready for use quickly after only a minimum time required for in plant installation. Select the most energy efficient system for your requirements; gas, oil, or electrically heated units are available with full microprocessor based automation instrumentation for optimum control of temperature, uniformity and productivity. Space saving, compact construction is rugged yet cost effective, featuring low energy loss refractory linings, heat recovery and recirculation systems. Custom designs are available with innovative manpower reduction accessories such as automated material handling from start to finished product to meet your specific production objectives. Rugged all steel case welded and reinforced with structural members to form an integral unit with an attractive exterior finish. Durable lining of energy efficient, graded multilayer ceramic refractory fiber and brick. Microprocessor based control system including failsafe equipment completely wired with all necessary UL/CSA listed instrumentation, data loggers, switches, lights, relays, meters, and fuses mounted in a functional NEMA panel. Automatic product positioning drive systems with easily adjustable electronic controls. High heat tranfer heating components positioned for maximum efficiency, temperature control and uniformity. Energy saving heat recirculation and recovery systems. Productivity enhancing tempered, rapid cooling provisions. Powered exhaust and afterburner incinerator systems to comply with applicable environmental requirements. Automated material handling, load and unload systems. Comprehensive instruction manuals covering operation and maintenance. Complete system, factory tested and shipped ready for use immediately after installation. turnkey and spare parts availability. Better service to our customers is the reason why UNIQUE/PERENY has made mastering heat engineering its business. 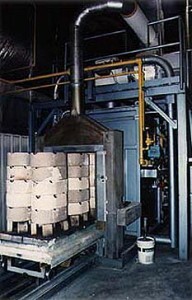 Today, hundreds of UNIQUE/PERENY kilns and furnaces are in operation worldwide. Let this experience work for you. Whether you want lower operating costs, higher productivity, better quality, more efficient use of production space or a whole new manufacturing technology, UNIQUE/PERENY will welcome the opportunity to help you find the solution that’s right for you.